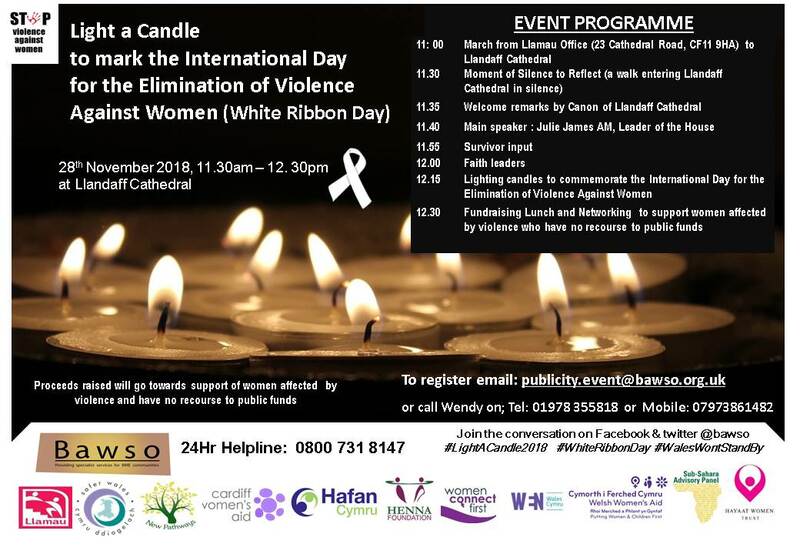 Llandaff Cathedral are holding a Light A Candle event on 28th November to mark the International Day for Elimination of Violence Against Women in aid of White Ribbon Day. On 28th November, Bawso in partnership with Cardiff Women’s Aid, Hafan Cymru, Hayaat Women Trust, Henna Foundation, Llamau, New Pathways, Safer Wales, Sub-Sahara Advisory Panel, Welsh Women’s Aid , Women Connect First and Women’s Equality Network Wales (WEN Wales) will be coming together at the annual Light A Candle event in Llandaff Cathedral in Cardiff to highlight violence against women in Wales, whilst also demonstrating the resolve of organisations across Wales to work together to end all forms of violence against women. The Light a Candle is an annual multi-faith event which marks the International Day for Elimination of Violence Against Women and creates an opportunity for Bawso and partners to come together to shine a light on the impact and prevalence of different forms of violence in Wales. By giving a voice to survivors and organisations that work with women and girls who experience abuse, we hope to raise awareness this is something we must tackle together. Speakers will include; survivors, the Canon of Llandaff Cathedral, Julie James AM – Leader of the House and representatives from various religions.